Trying to take everything off. I have the pickups unscrewed but dammed if I can get those cute clear knobs off. Loosen the screws but they don't want to come off. Don't want to force them and break the old plastic or screw up the pots. The DeArmonds looks good. The tortoiseshell guard needs a bit of binding replaced where someone painted on the missing bits!! . Can't get thos knobs off. i want to remove and clean the elctronics. Any idears? Original DeArmonds measure 9.73 bridge and 9.53 neck. I have all the knobs off and pots unmounted except for the master volume pot. I have the set screw out and just CAN"T get that cute little clear knob off! I'd desolder it except the wiring harness looks SO sturdy and well made and there's 2 coaxs going to the master volume. Wow Too, that guitar looks amazing. Will it need a neck reset do you think? No neck reset, just a bit of board planing after I get the frets yanked, and then a refet. I want to get the electronics Fully out to give them a clean. Many little things to do It'd be nice to hunt down a visually appropriate Bigsby. Probably one of those non V cut ones with the no black paint on the inset bit. Anyone got one? Congrats - that's a beautiful guitar! If you have reason to pull one of the Dynas off the body, I'd be very curious what if any bracing there is inside the body. I'm wondering if Gretsch did anything special with the electro bodies vs the acoustic ones, like the Constellation. Very nice straight up archtop bracing. rounded on the inside and lightweight. Not like the larger square ones you find on some. A laminate guitar but still with some old world archtop craftmanship happening. Now if I can just get that &^%*&^ knob off. All the electronics are coming out for cleaning. That's sweet!. It's weird they didn't have pickup selector switches. I'll bet that has a nice deep jazzy tone on the neck pup. Sweet! Its very reminiscent of an old, '51 L5 CES (actually SEC), one of the very first, I was bidding on years ago but lost. Nice one, Tox. 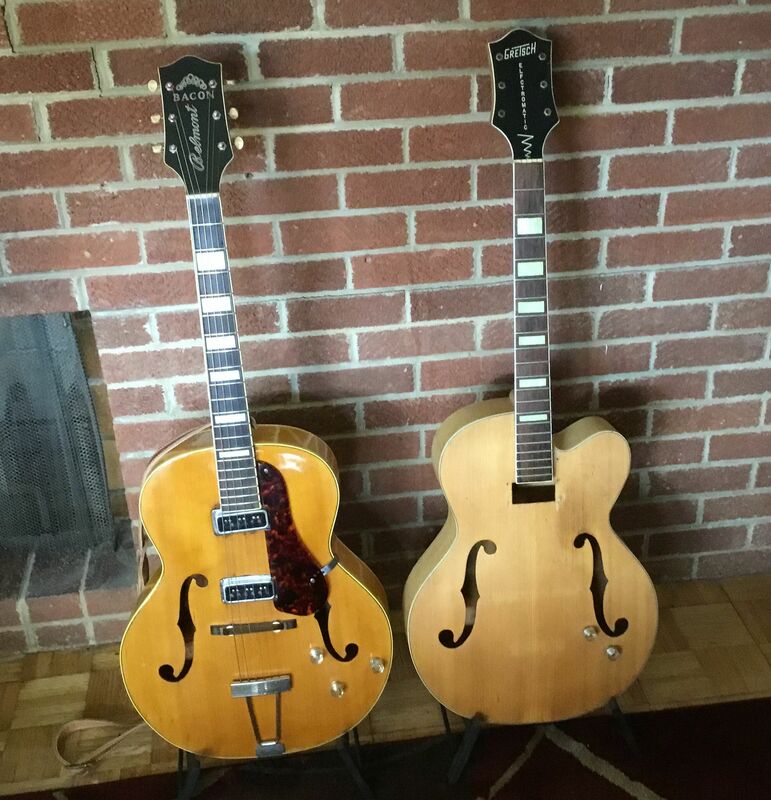 My 1950 Bacon Belmont is almost the same guitar but with no individual volume controls. They hadn’t yet figured out how to deal with two pickups. No switch, just a master volume, a tone knob and a knob to blend the balance between the two pups. Pictured here with a future project, a 1954 Electro. ‘Y’all might remember it as the ELFCTROMATIC due to a misspelling on the headstock. I have collected most of the parts and I’ll get to it when I have time. Beautiful wood on that guitar, congrats. 9.+ seems a bit high/hot for those Dynas, no? Could the selector be the knob on the cutaway? That's where I would expect it to be on a Gibson. If you haven’t worked with that black wiring harness before try not to move it at all. The outer jacket is usually in good shape but the black insulator might already have a million cracks in it. Once it moves around a bit it turns to powder and shorts out. That's good advice on the harness. Be careful. I've have them from that era that were perfectly supple, and others that were completely dried out. As to the pickup readings, that sounds right to me. Of about a dozen sets I've read from that era, all have been in the high 8s to high 9s range. You find the coolest projects. Rounded braces were standard up to the Filtertron era; even then a few early Filters had the rounded braces with strange trestle blocks. You could use a modern Bigsby with the paint off but you may want to drill the hinge plate to match the existing holes, as this looks to be in a higher than just-a-player grade with that flamey back. Just noticed there was an added strap knob pin on the upper bout -- Electros didn't have those. Make sure it's sunk into solid wood before using a strap. This guitar, though these photos look sharp and it has nice flame on the back, has been refinished, there are some runs and drips and some sanding marks in the top. The finish is for the most part very thin (which is good, for removal but not as good for cleaning up/light wet sanding, hand buffing.) There's some scratches in the spruce and some dubious looking sanding(or brush marks) on the top as well. On a scale of one to ten, if 1 was a child with a brush and 10 was a pro, I'd maybe give it a 4-5. The headstock faceplate is particularly rough looking(finish) with some dubious binding repair. I'll include a photo which manages to capture some of the oopsies but it's hard to depict and worse than it looks, because the wood has such a lovely ambered quality to it. I'm on the fence as to how to treat it but will probably try very light wet sanding and buffing to see if I can avoid a refinish. The board needs some work. It's hard to tell but it looks like the whole neck might be angled slight towards the bass side. (which I don't mind) Certainly the extension was either off kilter or warped up on the treble side as the board almost tapers to a point on that side due to some planing, If you site down either side, with the strings off it doesn't look so bad , burt still has bumps and dips to sand out. The harness is heavy and quite stiff, so I will try to leave it alone. if it starts to act up I will replace the whole business except for the pots , pickups etc. I have no patience or interest for ancient deteriorating wiring. The heastock is interesting. the tuner holes have obviously been reamed out, maybe under the influence. They are larger and not quite round on the back. The imperial grommets are loose on the front. I will probably plug them with maple dowel and carefully re drill from the front. the grommet edges will cover the dowel on the front and I think I will try to paint some black o the back of the headstock like the old electros.